Posted November 27, 2007 by grohling & filed under Reports. 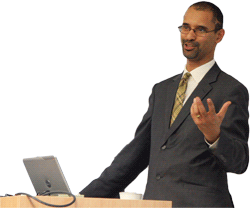 We were delighted to welcome Tom Ilube as the speaker for our 2007 Christmas lecture. 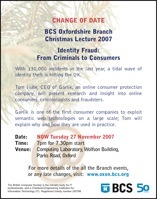 Tom was CIO of Egg and is now CEO of technology startup Garlik, a new company aimed at increasing consumer awareness of what information about them is publicly available, and helping to prevent identity theft. the announcement on 29 November 2007 from The World Economic Forum that Garlik was one of 39 visionary companies selected as their Technology Pioneers 2008. If you missed Tom’s talk (and even if you didn’t) you may be interested to watch this interview which was released to mark the WEF announcement. Garlik’s announcement, also on 29 November, of a free service called QDOS which is aimed at getting consumers engaged with their own online digital presence. Tom explained that many people find it hard to relate to the concept of digital identity. Their eyes glaze over when you try to talk to them about it. Makers of shredders have capitalised on consumers’ liking for something tangible, and indeed one shredder manufacturer has sponsored security events: unfortunately, people may be tempted to think that their identity is safe just because they have bought a shredder. Tom told us how relatively easy it was to find out enough information about many individuals to be able to use those details to apply for credit cards and even passports. The task is made even easier by people who are willing readily to disclose personal information and who agree to be "friends" with strangers on social networking sites such as Facebook. In the identity theft industry, typically, personal information about individuals is collected and sold on to others who make fraudulent use of it. It is hard for law enforcement agencies to proceed against the people who collect information: gathering information from public sources is not illegal per se. If questioned, they can claim they are just doing "market research". However, such information can be sold on, and Tom was therefore able to put a potential value on the information in the CDs "mislaid" by HMRC. In a lively Q&A session after his talk, Tom explained how Garlik had built a data store which now contains billions of RDF triples which define the relationships between people and their personal data. This technology, he said, scaled much better than conventional relational databases because of the overhead of building and maintaining indices to support efficient queries on any column. Elsewhere on the web, Steve Harris, a software architect at Garlik, has posted that the Garlik store imports at over 70k triples/sec and that’s only just fast enough to keep up with incoming data. After the meeting, Tom had to hurry away to work on what we now know was the upcoming launch of QDOS, but many attendees repaired to the Lamb and Flag to continue the discussion over the now traditional mince pies and mulled wine.